I get very excited about working in the autumn garden! Summer's heat begins to abate, the days grow shorter and it is more pleasant to work in the garden. There is a heightened sense of urgency to get things done before the coming winter. And there is a lot to do because it is a great time to plant new trees, shrubs, bulbs and perennials for the coming year. Fall is the best time to plant most things because it gives root systems a chance to become established before the ground freezes, and that gets the plants off to a good start in spring. The autumn garden displays the most spectacular show of the year in some areas of the country. Leaves change color as the days become shorter and nights cooler, photosynthesis slows, and the green chlorophyll in the leaves fades away. 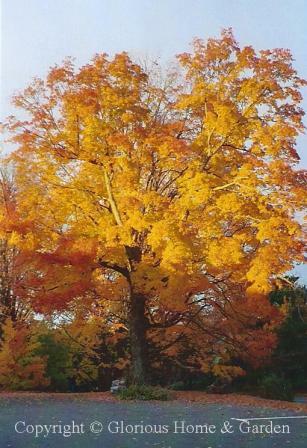 Reds, yellows, oranges, purples and browns emerge as the chemical changes occur in the leaves. Rainfall, temperature, and location also play a part, which is why it is difficult to predict peak fall foliage times and why some years are more spectacular than others. Mother Nature will have her way! Certain species exhibit more color than others, and specific cultivars have been chosen that are more likely to display consistent brilliant color. By selecting a few trees and shrubs with the best autumn leaf color for your own fall garden, you will increase the beauty of your property and your neighborhood. Here is a list of some of the best trees and shrubs for colorful fall foliage. Visit botanical gardens and nurseries in the fall to select the best for your area. Consider adding a few autumn-blooming trees and shrubs to your landscape. These non-conformists spice up the end of the season with charm, color--and some with great fragrance, too. Fall blooming camellias are essentials in the warmer parts of the country. The sense of transition in the fall garden is palpable, and we look forward to enjoying the blooms of fall-blooming perennials such as asters, chrysanthemums, Japanese anemones and others. Don't forget fall blooming bulbs. Some of our favorite spring bulb flowers have species that bloom in the autumn. Fall also brings the ripening of fruits, nuts and berries --some of which are quite ornamental and persist for a long time--or at least until the birds devour them.